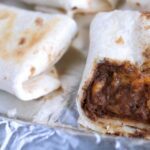 A kid-friendly, baked black bean and cheese burrito recipe featuring black beans, cheddar cheese, and hidden vegetables! Perfect for freezer-friendly dinners and make-ahead lunches! So I have this daughter, right? She’s seven. Super cute, love her so much. 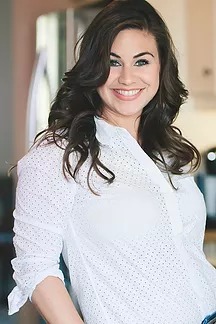 She is sugar and spice, and everything nice….except when it comes to food. And, oh-my-goodness gracious, is that child a picky eater. What to send in that kid’s lunch box is a constant battle, and Lord forbid I send her with a nice, normal turkey sandwich like pretty much every other child on the planet. No. My girl has high standards when it comes to the lunchbox, and really, I don’t know that I have much room to talk. I too am a choosy eater. So when a new school year rolls around, I do quite a bit of brainstorming when it comes to lunchbox ideas. Ideally, they meet this criteria: (1) easy to make, (2) at least somewhat healthy, (3) make-ahead, and (4) preferably freezer-friendly. For a while, I just sent her with sliced chicken breasts, along with a tortilla, with fruit and crackers on the side. She loved her little, deconstructed tacos, and the meal 100% met the criteria: The chicken was super easy to make, it was healthy, and I could freeze the sliced chicken. However, after a year of alternating between this and the mini turkey burgers, she was ready for a new addition to the line-up. A good friend of mine had recently shared that when their family goes out for Tex-Mex, the only thing her son would eat on the menu was a bean and cheese burrito. And, it just so happens, my girls can get down on some beans. What if I could make a kid-friendly bean and cheese burrito…but like, healthy? Naturally, black beans would do the best job at masking those sneaky vegetables I had planned on stuffing in there, so a black bean burrito it would be. Oh, and with cheese. Can’t forget the cheese. I did say “kid-friendly” after all. 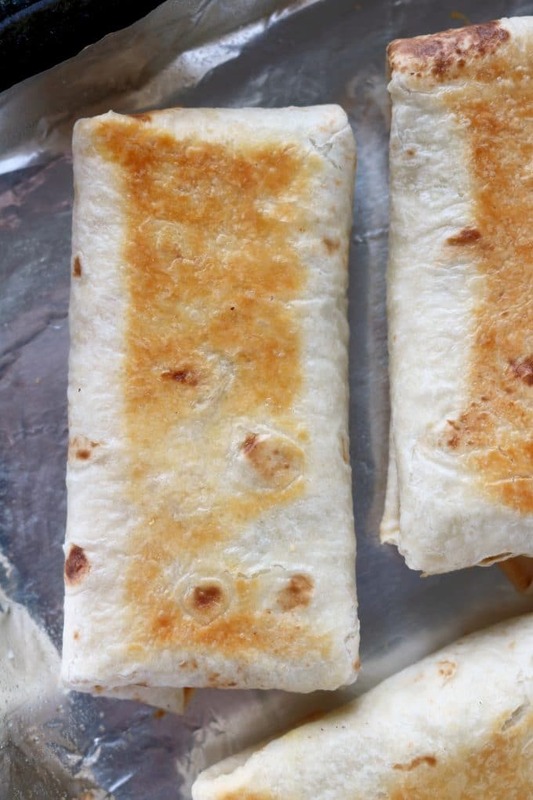 To make kid-friendly bean and cheese burritos, they should first be, well, kid-sized. So rather than using the giant tortillas most burrito recipes call for, just plain ol’ standard-sized tortillas will do. And as it turns out, this size is plenty filling for both the kids and the mom. I started with protein-packed black beans, a wise starch option for the kiddos and added a little more nutritional value to the mix by throwing in a few extra vegetables. Carrots, sweet peppers, and onions not only scored us a few mom points in the healthy department but in the flavor department as well. Bonus. And, the beauty of it? If your kids think they don’t like those vegetables, in particular, they’ll never even know they were there. Double bonus. The beans and the vegetables simmer together on the stovetop for three reasons: (1) for the vegetables to soften up, (2) to build flavor, and (3) to reduce so that our mixture is the perfect consistency for spreading on the tortillas. Now, onto hiding those vegetables, and making a smooth and creamy, addictively delicious bean filling while we’re at it. The bean mixture goes either into a blender or food processor fitted with a paddle attachment and takes a spin. If you don’t want to pull out the electronics, you could let the back of the spoon do the work for you, and mash away to your little heart’s content. Next, the mixture is mixed with grated Cheddar cheese (freshly grated is ah-mazing if you can spare the time), and packaged into a burrito. This portion of the recipe took a minute to develop the perfect “burrito folding technique,” but lucky for us, mission accomplished. 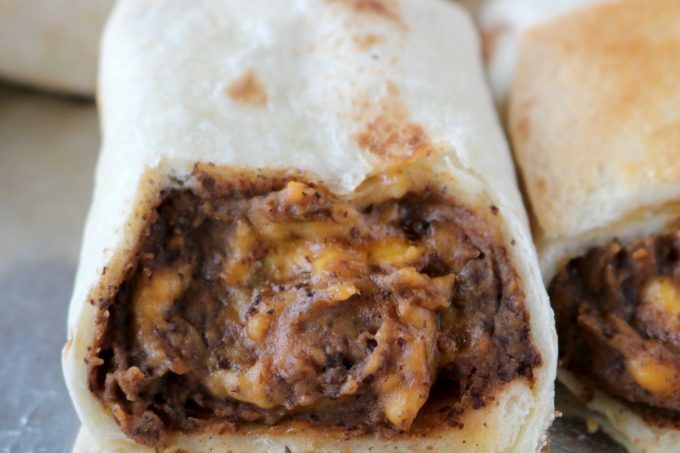 Part of what makes these bean and cheese burritos so scrumptious is their crunchy exterior, giving the burrito a nice variation in texture and a melty, gooey cheesy interior. Yes, please. To burritos are hit with a little canola spray, and turned halfway through the cooking process to ensure even cooking all around. Freezer-friendly foods are such a convenience, especially when it comes to lunchtime. To freeze your burritos, allow them cool, wrap them in wax paper (using the burrito method used above), and transfer them to a freezer-safe zip top bag. They will keep well for at least three months in the freezer. To thaw, remove them from the wrapping and place them in the microwave for 1 1/2 – 2 minutes. If you are sending in your child’s lunchbox, note the filling is very dense and could take 1-2 days to thaw in the refrigerator, so plan accordingly. 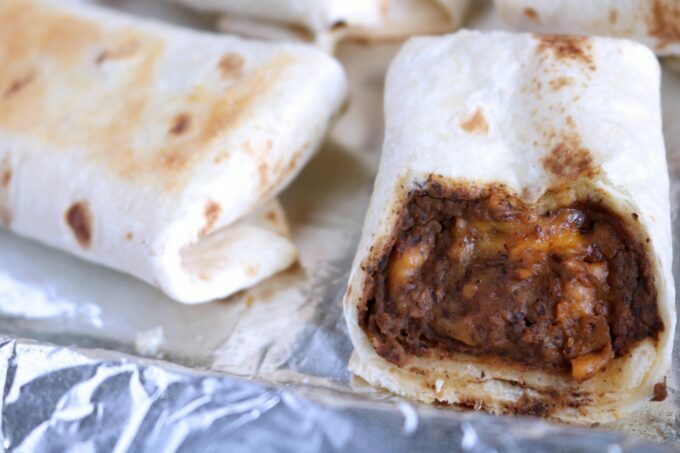 As it turns out, these black bean and cheese burritos with hidden vegetables met all the lunchbox criteria: easy, healthy, make-ahead, and freezer-friendly. But most importantly, it’s a meal the kids and the grown-ups can look forward to. Mini Turkey Burgers are quick and easy to whip up, and require few ingredients! Make mini turkey patties on the stovetop in minutes, toast up some wheat bread, add ketchup, and !VOILA!, lunch is ready. Who doesn’t love a corn dog? These Mini Muffin Corn Dogs made in a muffin tin are great for make-ahead lunches, as they’re freezer friendly and perfect for packing in school lunches. Pizza Bagel Bites are a nostalgic favorite for us 90’s kids, but kiddos today will go crazy for this easy homemade rendition. Featuring miniature bagels, pizza sauce, cheese, and pepperoni’s, these are a definite win at every table. Kid-Friendly Pasta Salad is easy to make and healthy to boot. Tortellini pasta, cubes of Cheddar cheese, broccoli, and green beans all tossed up in a storebought Italian dressing makes easy work for mom! A kid-friendly, baked burrito recipe featuring black beans, cheddar cheese, and hidden vegetables! Preheat the oven to 350° and have ready a baking sheet. Add the olive oil to a saucepan over medium heat and allow the oil to come to temperature. Add the pepper, onion, and carrots, and sauté for about 8 minutes, or until softened. Stir often. Add in the beans, cumin, garlic powder, salt, and pepper. Allow the mixture to come to a rapid simmer. Reduce the heat accordingly to maintain a simmer for about 10 minutes, or until slightly reduced. Stir often. Transfer the beans to a food processor fitted with a paddle attachment, and process until smooth. If you do not have a food processor, you could use a blender or the back of a wooden spoon. Stir in the cheddar cheese. 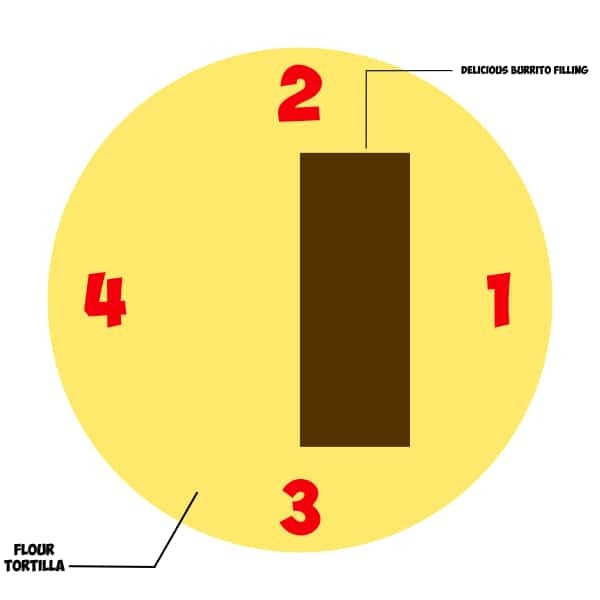 Scoop a scant 1/4 cup of the mixture onto each tortilla and roll into a tight burrito. Mist both sides of each burrito with cooking spray, and transfer to the baking sheet. Do not overcrowd the sheet, and bake in batches if necessary. Bake for 10 minutes. Turn each burrito, and bake for 10 minutes more. Allow to cool slightly, serve, and enjoy. Why do you specify canola oil? Canola oil is not good for you at all. There are coconut and olive oil sprays that could be used, which are actually healthy oils. I specify Canola oil because it is an affordable oil for readers with a high smoke point. Feel free to sub in another oil (with a high smoke point) that you are comfortable with! Does this recipe not need any liquid or are you meant to use the water from the tin of black beans? I have 2 boys who both used to be incredibly picky! Good news is that now 12 & 14 they eat almost everything! There’s hope! 🙂 Though it the meantime, if these delicious looking burritos are a favorite, than you’re doing great!! My kids will love these too! That sounds like a fun recipe! Hearty meal for weeknights. This sounds like such a tasty dinner idea! I’m all for hiding veggies in meals to get the kids to eat more! These burritos look great! I love a great veggie-filled recipe! This is a great go to recipe! We are getting ready for back to school, so need to try these. Thank you, Sandi! It’s one of our favs for sure!